Aitchisons Property Centre is recognised as one of the leading independent Estate Agents and Letting Agents in North Northumberland and the Scottish Borders. Established in 1971, it is the longest established agent in the area, giving expert advice on all aspects of the local property market. As a family run business, personal service is a real strength of the company, with three generations of the family being involved. As an independent company, they can adapt and adjust to the ever changing market and clients requirements, tailor making a solution to meet all their client's needs at market leading commission rates. 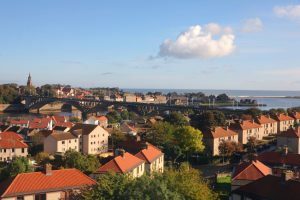 The company has offices in Berwick-upon-Tweed and Wooler, which are ideally located to cover most towns in North Northumberland and the Scottish Borders. Aitchisons Property Centre will always act on your best interest at all times. With highly motivated staff with a wealth of experience, nobody is better placed to give you advice on your property requirements. Aitchisons Property Centre are delighted to announce being main sponsor for Wooler Cricket Club. The cricket team plays in the Northumberland League and is actively involved in coaching juniors within the town. Andrew Aitchison has played for the club for a number of years, during this time he has captained the club. "Excellent service. We needed professional advice about our property and they came out the following day to our home and gave expert and very reassuring advice. I would highly recommend Aitchisons Estate Agents to anyone wanting to sell or buy a home." " Used Aitchisons twice in 8 Years for buying and Selling. The Friendly Staff Provided a high quality, professional service that was beyond reproach, resulting in a sale after just 3 Weeks in what was a bearish market at the time. From helping with appointing solicitors, to unraveling all the technical jargon involved in a sale, they left no stone unturned. Highly Recommend." "Very pleased with the service provided. Would recommend"